Giveaway! 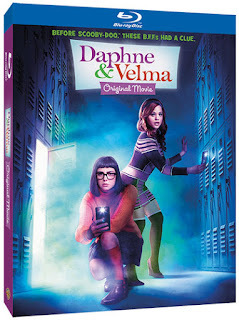 Daphne & Velma on Blu-ray from Warner Bros. Home Entertainment! Jinkies! The smart and resourceful women of the iconic Scooby-Doo franchise, come to life in an all-new mystery with the release of Daphne & Velma from Warner Bros. Home Entertainment. Daphne and Velma is out on Blu-ray as well as Digital and DVD on May 22, 2018. Jinkies! Your favorite mystery-solving teenagers are back in an all-new, live-action feature-length movie! State of the art robots and high-tech gadgets are common sights at Ridge Valley High, an innovative center of learning for some of the brightest minds in the country, including new transfer student, the bright & optimistic Daphne Blake (Sarah Jeffery) who is excited to finally go to school with her online bestie, the whip-smart & analytical Velma Dinkley (Sarah Gilman). But not everything is as innocent as it seems as mysterious disappearances begin to plague the top-performing students on campus. Once cheery and full of life, kids now appear in a “zombiefied” state - lifeless and shells of themselves. Can Daphne and Velma learn to work together and save the students or will they become the next victims? adventures of Mystery Inc.’s fierce female duo. Produced by Ashley Tisdale and Jennifer Tisdale’s Blondie Girl Productions. Daphne & Velma will carry a suggested retail price of $19.98 for the DVD and $24.98 for the Blu-ray. Labels: Blondie Girl Productions, Blu-ray, Daphne and Velma, Decryptor, giveaway, Home Entertainment, Mystery Video, Soundboard blog app, Warner Bros.
"Do you have a favorite Scooby Doo episode or favorite character?" My favorite character is Scooby Doo, and my favorite episode was the one that concluded with that villain angry with the meddling kids! My favorite character is the whole gang working together! Velma was always my favorite growing up! No favorite. I loved them all. Scooby is my favorite. Scooby Doo has been my favorite since I was a kid. I liked the recent scooby gang meet up with the Supernatural guys. Favorite character is Scooby doo.